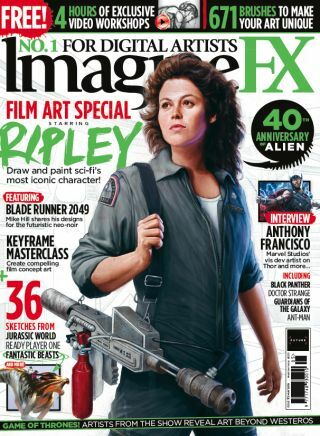 This month ImagineFX is off to the movies as we hear from leading artists currently working in the film industry. Inside issue 173, which goes on sale today, you'll learn how big names have come to work on top titles, as well as discovering how to create famous characters from the big screen. If you've always wanted to get your work in front of cinema goers, this issue will tell you how to get there. Elsewhere in issue 173, artist Patrick J Jones continues his epic figure drawing series. In this issue, he shows you how to master the art of chiaroscuro and create dramatic light and shadow. With his insights, you'll be well on your way to harnessing their dramatic properties. On top of that, we hear from pixel artists to learn why their medium is much more than just a retro aesthetic. There's also all the news, reviews and art from our wonderful readers that you've come to expect from ImagineFX. Make sure you don't miss it, order your issue and subscribe today! How far would you go to work on titles such as Black Panther, Thor: Ragnarok and Guardians of the Galaxy? For artist Anthony Francisco, it meant long shifts refining his skills into the early hours of the morning. In our interview, he shares how he went from having no portfolio to working on the biggest cinematic franchises. Few things are more tantalising for artists than looking inside another person's sketchbook. In these hallowed pages you get to see how ideas have been worked through and refined. In this issue, we delve into the sketchbook of concept artist Jama Jurabaev and discover early drafts of creatures from the latest Fantastic Beasts film. If you want to get into the film industry, it helps to have a passionate interest in the medium. That's just what Mike Hill has, as he reveals to us that when he likes a film, he watches it back slowly, carefully, to see how it works visually. In this interview, we discover how this obsession has lead to him working on the likes of Game of Thrones. To celebrate 40 years since Alien hit the big screen and remind people that in space, no one can hear you scream, we take a look at how to create the film's hero, Ripley, in Photoshop. And with this step by step tutorial, you'll be able to recreate this iconic character. Rendering keyframe art from a real location is par of the course for some concept artists. But what does it involve, practically? Concept designer Henry Fong has worked on projects for Walt Disney and Sony Entertainment, and he's here to walk you through the process.